Woot was founded in July 2004 and are the ones to thank for the one day one deal business model that has gained such tremendous popularity over the years. In fact this same business model has even made it possible for local businesses to reach more customers online via group buying platforms such as Groupon. Aside from Woot's business model, their sales approach is a bit unique and bold at the same time. While some businesses might not be able to pull something like this off, Woot has managed to do so. Goes to show that business risks do pay off because nearly 6 years later, on June 30, 2010, Woot announced an agreement to be acquired by Amazon. Since that time Woot continues to see growth and their bags of crap :) continue to be flying off the shelves, and people continue to anxiously await their Woot-Offs; which give people opportunities to save money on multiple deals throughout the day. 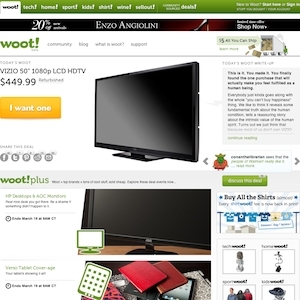 Woot also offers deals in other categories such as children's wear, shirts, sporting goods, home and garden, tools and garden, wine, tech, sellout and accessories. Woot.com currently ranks #12 amongst sites offering online deals -- DX Offers ranks #11. In the General Merchandise category, Woot ranks at #9 -- Deals.dx.com again ranks slightly higher at #8. Woot is considered the most popular deal a day site, ranking in at #1. As for the 2nd most popular site, it's Giveaway of the Day.